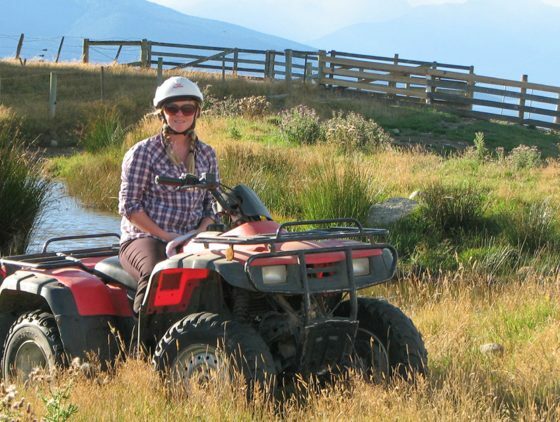 Ride over our Westray farm on a Horse Trek or Guided Quad Bike Ride. And be greeted by our other friendly horses and farm animals. 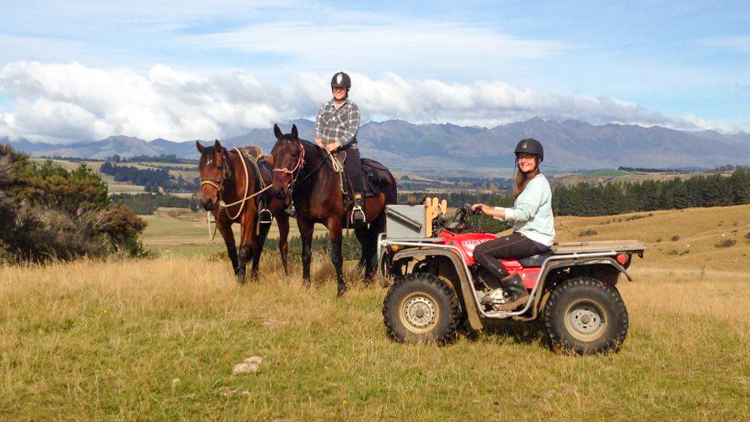 Horse trekking and quad bike rides on the trails of Te Anau, New Zealand. 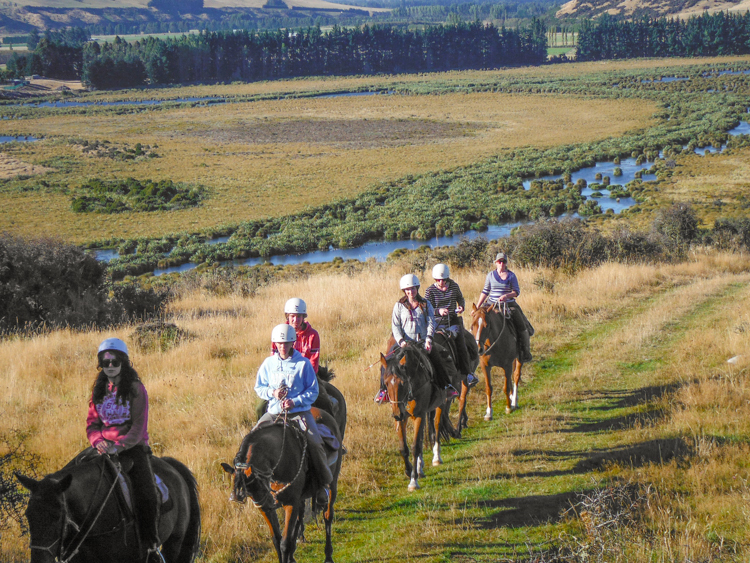 Come and ride with us at Westray Farm Horse Treks. 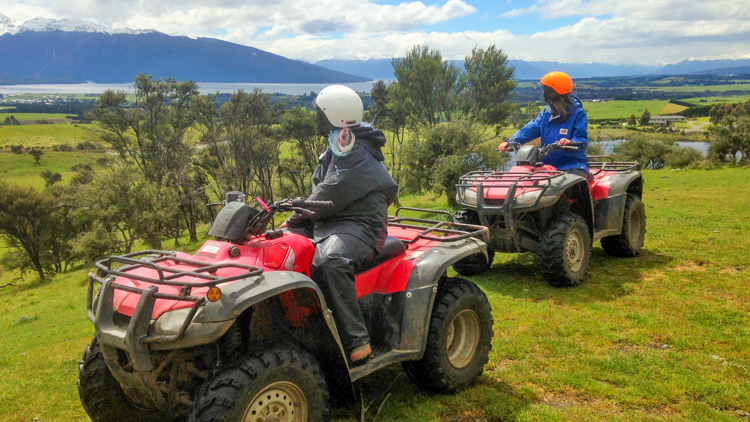 We are located in the beautiful lakeside township of Te Anau nestled within the world renowned Fiordland World Heritage Park. 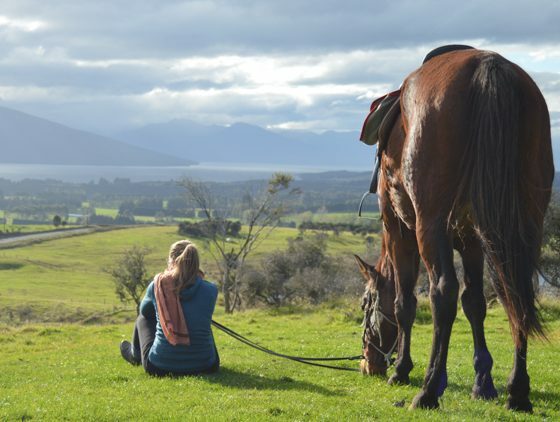 Come and and enjoy the best views that our beautiful area of Te Anau, New Zealand has to offer. 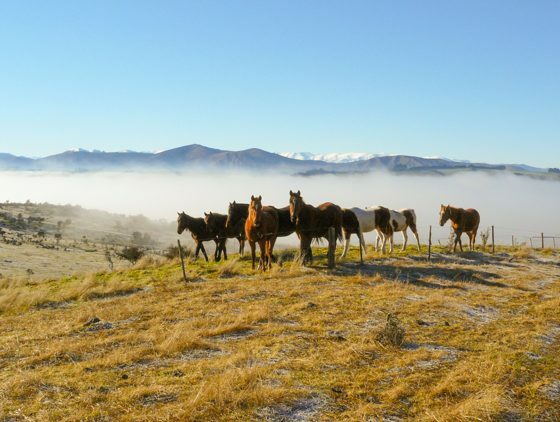 We breed and train our own horses on our farm where the horses are allowed to roam free on the hills overlooking the lake and mountains or the grassy fields on the plains. 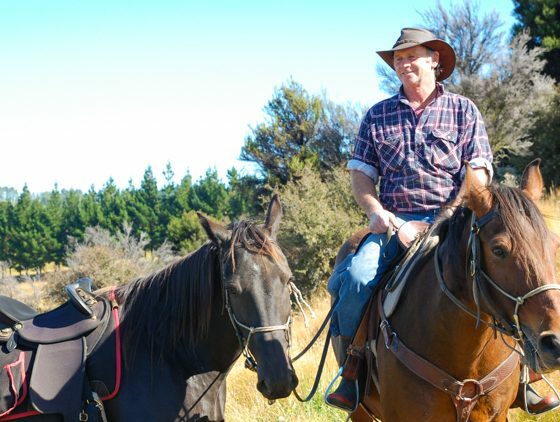 We also run cattle and sheep on the farm and the horses live in harmony with these other animals. 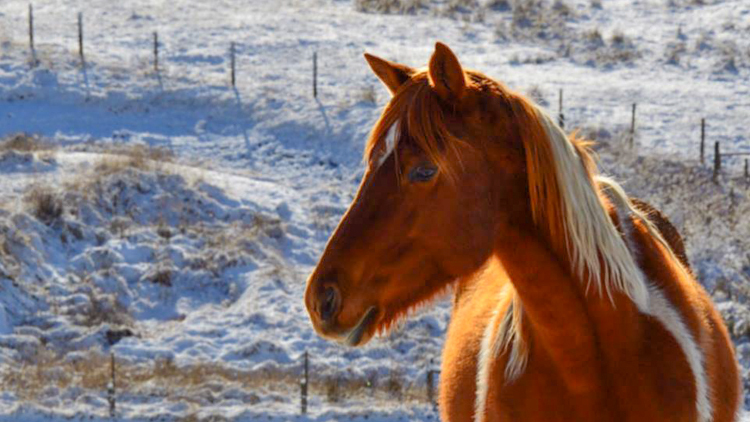 Ride over our Westray farm and be greeted by our other friendly horses and farm animals. 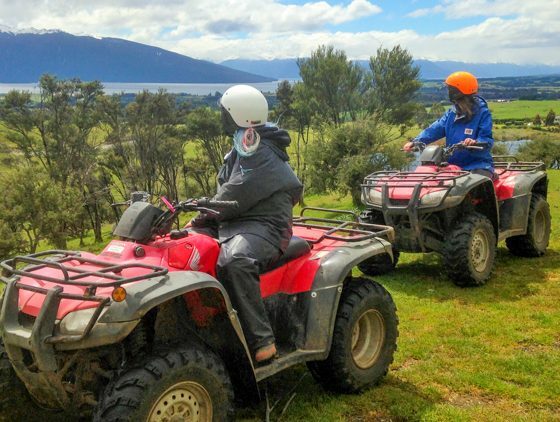 Enjoying 360 degrees of panoramic mountain views of Lake Te Anau encompasing views of the Te Anau township and the surrounding mountain ranges, wildlife reserve and farm land. 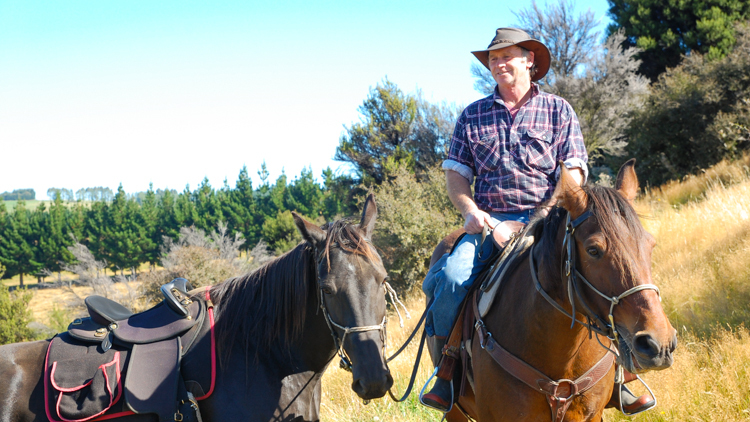 Our horse rides are approximately 2 hours which includes full safety training. Shorter rides are available by negotiation. are calm and will look after you. 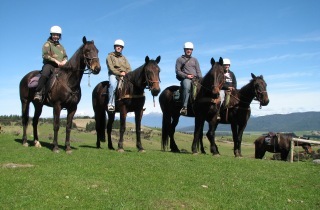 Our client to guide ratio depends on the experience of the riders. 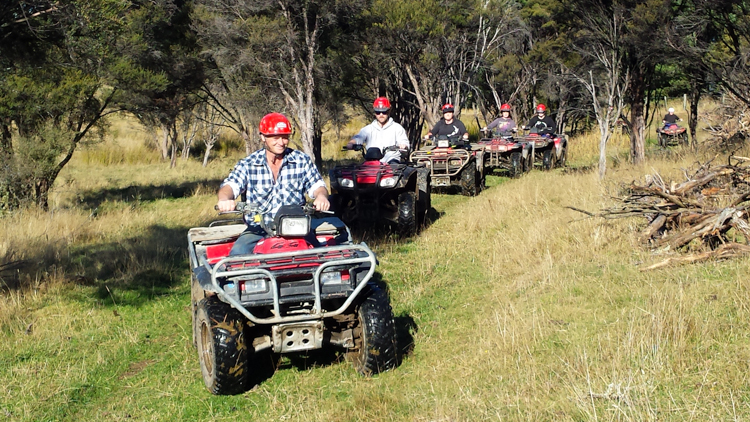 For beginners we have a client to guide ratio of at least 1 guide to 4 beginner riders for maximum safety and comfort. 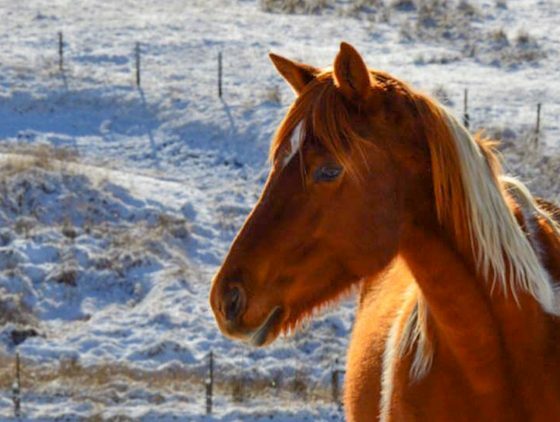 For the more experience riders we have horses with a bit more spirit so we can match a horse to you so you can have fun too. 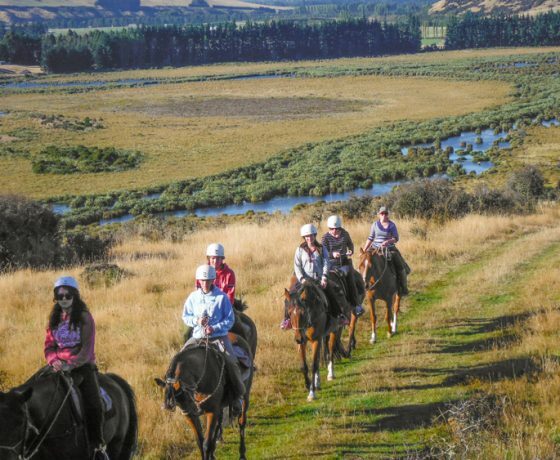 We can cater for different levels within the group so if someone in the group has had no previous experience but you want to canter on the ride we allow for both of you to get the most from your ride. This needs to be arranged in advance so please tell us at your time of booking. 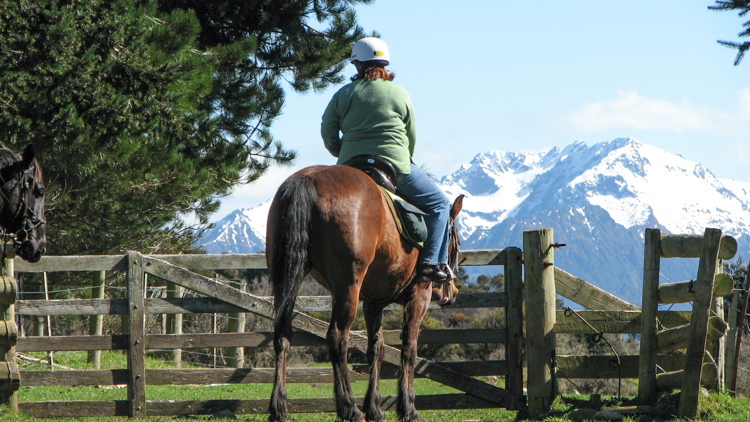 We provide you with safety equipment and full training to ensure you are comfortable with riding a horse. 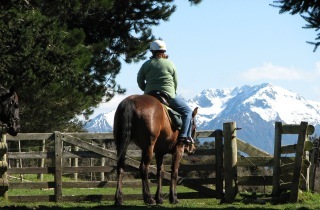 Please note for your safety, and our horses well being, we have a rider weight limit of 95kg/210lbs. 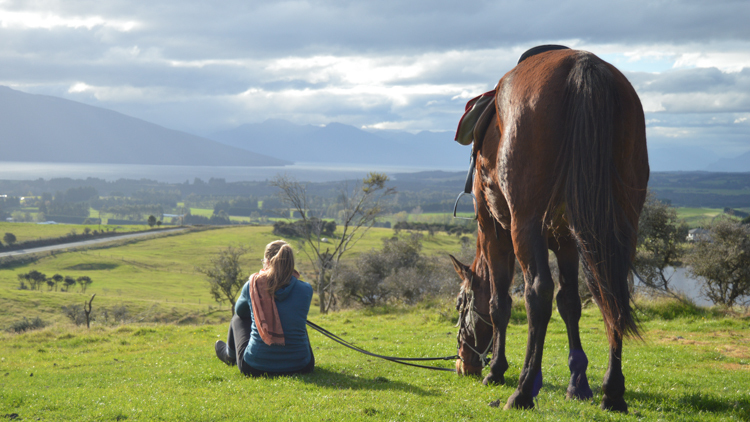 We also offer horse treks in winter, when the views can be even more spectacular than in summer. 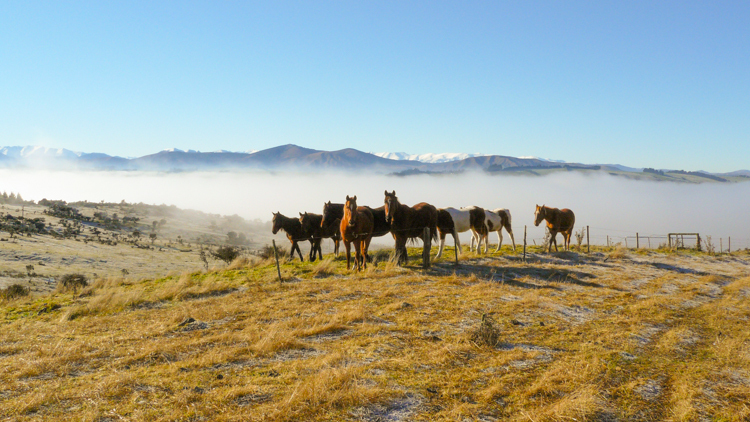 As we are located just 5 km from the Te Anau township, you spend your time with the horses rather than getting to our stables. Pickups can be arranged if required. Sunscreen and a windbreaker / light rain jacket – Sturdy closed toe footwear – Long trousers. N.B. Remember our rider weight limit is 95kg/210lbs. 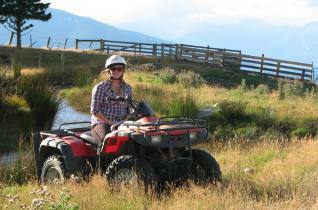 Te Anau Quad Bike trips. 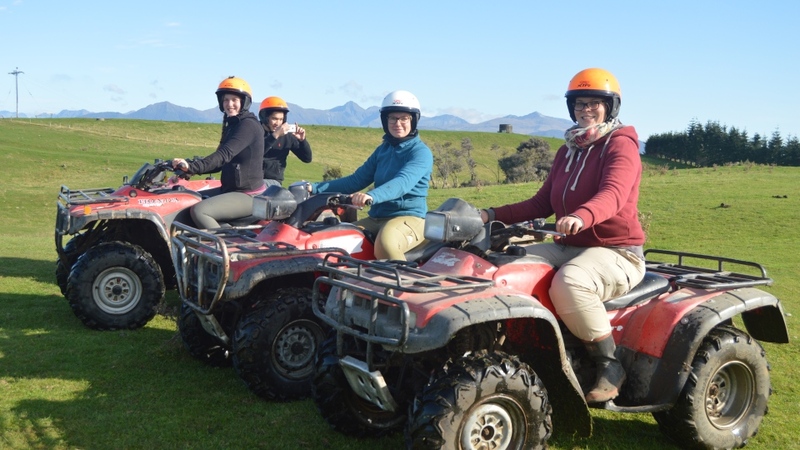 Our Quad bike tours are truly a memorable and an unforgettable kiwi experience, our guests will ride with experienced guides over our working sheep and cattle farm. 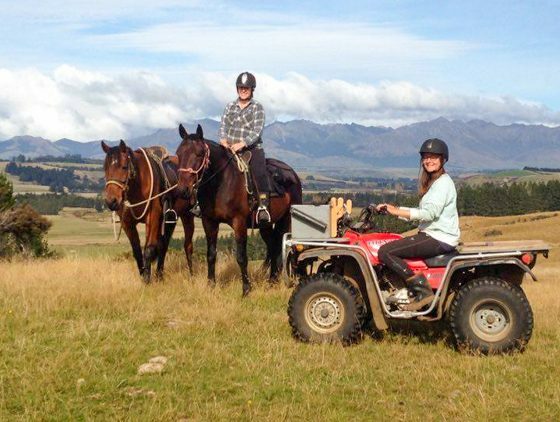 Your ride will showcase 360 degrees of the breathtaking scenery that Fiordland and Te Anau has to offer. 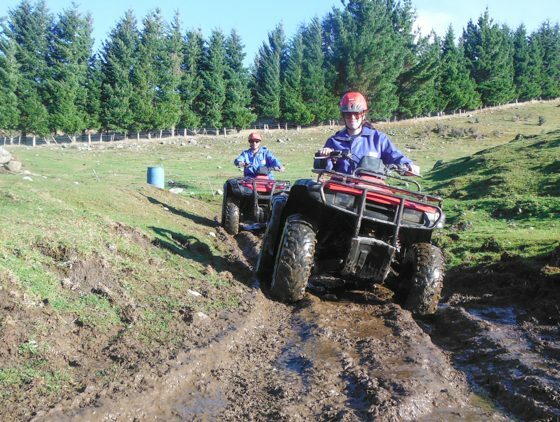 Our Rides can last up to 2 hours which includes full training. 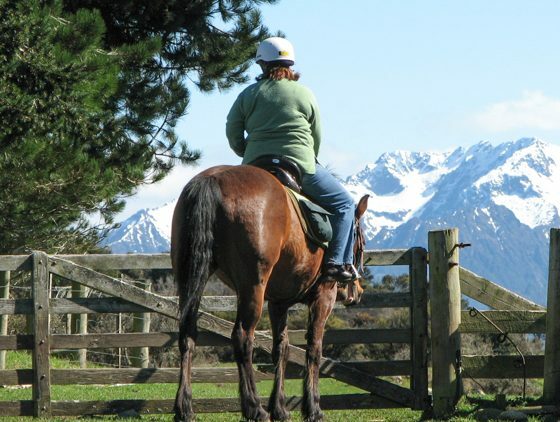 We are only 6kms from Te Anau township therefore you can either drive to our base or use our courtesy transport service. 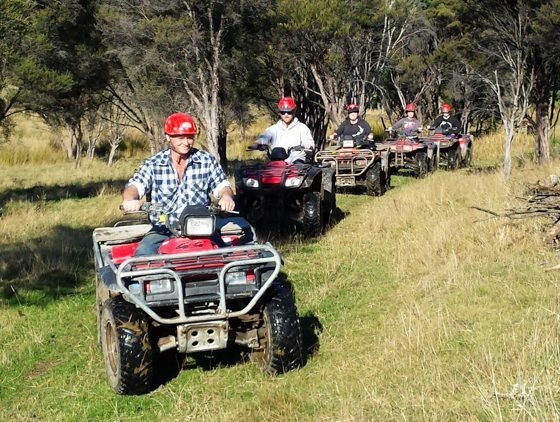 Our Honda Quad bikes are specially designed for farmers, they are fun and easy to ride. 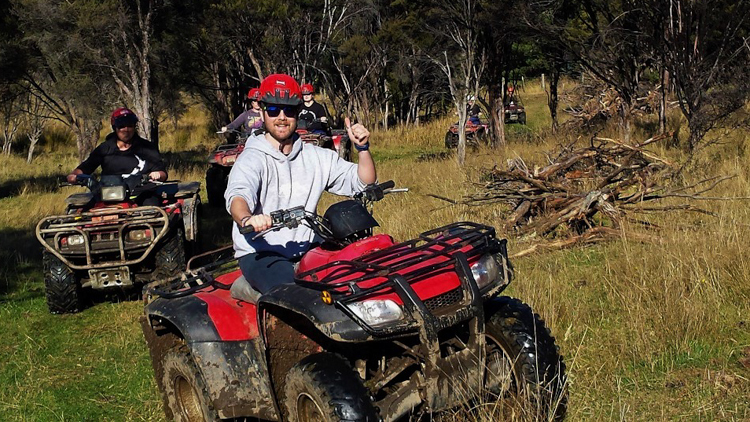 Whether you are a complete beginner or experienced rider we can tailor the trip to suit your abilities. We will provide you with protective wet weather clothing and full training so all you need to bring is your camera and wear clothes to suit the weather conditions. 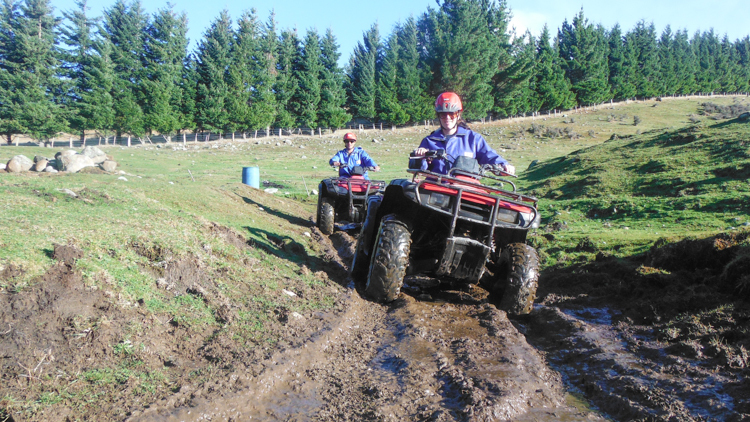 A full safety briefing given as well as full instruction and tuition on how to ride your quad bike. 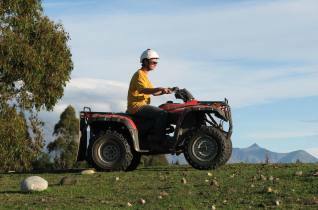 This is to ensure that you are comfortable with operating your quad bike. Once the safety briefing is complete, you will go with your guide out to our familiarisation and training paddock. 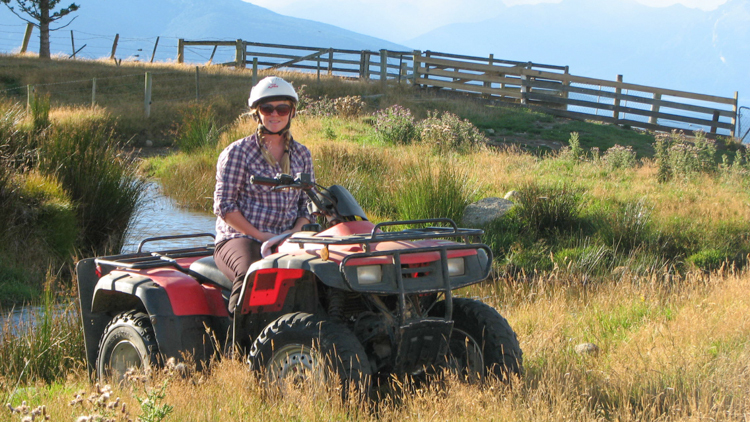 That is where you can get the feel for your quad bike. You will be given comprehensive training that will provide you with all the skill and confidence you need before heading out on the tour. 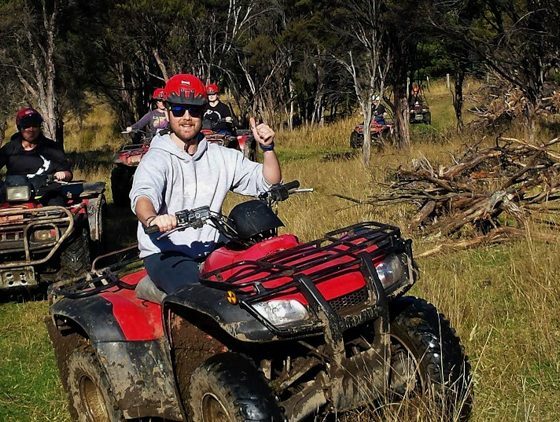 The more time you spend riding the quad bike the easier it becomes. 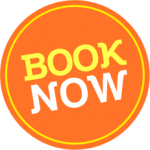 We can cater for individuals or groups up to 5 people. Beginners and people with no previous experience are welcome as we will provide you with full training and safety equipment so you can be safe but have fun! For your safety and comfort, our client to guide ratio is 1 guide to 5 clients. 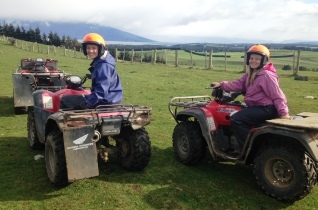 Riders MUST BE 16 years of age to ride our Quad bikes. 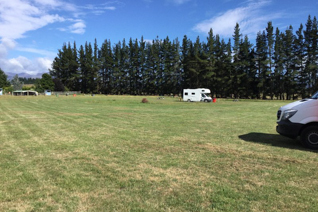 Andy’s place is designed for Fully Self-Contained campers only. 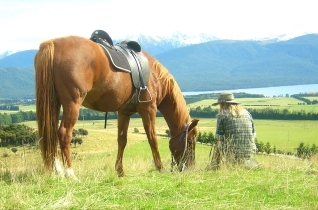 It is located just 6kms from the Te Anau township where you can relax in the quiet, sheltered rural setting.